John Ortberg at his best, describing God's way of developing people. "God is a hand-crafter not a mass producer." 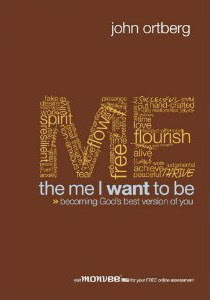 The video below is Session One from the DVD curriculum for his new book titled The Me I Want to Be: Becoming God's Best Version of You. While the title smacks a bit of self-help (ala Joel Osteen's Your Best Life Now) I'll tell you that I've read it and it is solid gospel. The book is being released in conjunction with the most exciting use of new technology for the Kingdom I'm aware of: monvee. You can read my earlier post on monvee, or suffice it to say that monvee generates customized spiritual growth plans for users based on unique characteristics such as spiritual maturity, learning style, personality type and spiritual pathway. Recommendations come in the form of suggested devotional practices, books to read, and ways to plug into community or serving through your church. If you're a pastor who wants to help your congregation "go deeper" and find cookie-cutter programs lacking, I suggest you explore monvee. You can watch the Monvee preview video here. Below is a sample session from the DVD curriculum with The Me I Want to Be. Another North American Christian fad. Why do we need to contiually reduce the gospel into something that we can package and market? Monvee is nothing more than the latest seven steps to ________ you pick the title. Let's get back to the word of God and get rid of all this trash. We are to become the character of Christ. Die to flesh and let the Spirit control you. Thanks for the comment. The character of Christ is indeed the goal of monvee, as is death to flesh and Spirit-driven life. I can't help but wonder if you're criticism is ill-informed. Have you used or even seen monvee in action? The Word of God is key, the question is HOW to approach it. Monvee is a HOW not a WHAT. with allusion to your catalyst/hipster posts, ironically monvee is marketed on a cool macbook and not some non-descript pc. Brian, thanks for the comment. Mac used to be the counterculture "hip" brand, but it's mainstream and thus"cool" now. That said, I'm pretty sure it's a sweet PC in the video, not a mac. Mac's on the website,though. I came across this blog today as I've been checking out monvee. I just wanted to say that I'm impressed with your gracious responses to harsh criticism. Good work man. I think I'll be giving monvee a shot. Everything I click on to get to the website comes up as 'Server not found'. Did they take it down?